We're proud to support this exciting new initiative that helps demonstrate the organic benefit, from personal well-being to a cleaner environment. When you visit the site you'll you'll see how by simply choosing organic, you're helping realize many of your highest aspirations, such as a healthy future and a healthy environment. Aside from significant information on organic you'll find on the site, you can also sign-up for the newsletter with helpful tips, recipes and great organic offers. Check it out soon for fun contest announcements and valuable prizes you won't want to miss. First of all, happy 2nd anniversary to our baby. Penny had TPLO surgery two years ago last week. We cannot praise Dr. Robello and his staff at Pet Care enough. Brilliant surgeon, awesome facility. If your dog needs this surgery done and in you're in the SF bay area, make the trip to Santa Rosa, it is worth it. Second, we're really thankful for some good press lately. Modern Dog Magazine has featured us in their latest issue. Thanks! We played a little hooky and took an afternoon hike at our favorite nearby spot. We're living a charmed life here in beautiful Sonoma. Here's Ray & Penny [and me] heading out on the lakeside trail at the Eldridge State Hospital and Glen Ellen Regional Park. It's really close to home, we go there alot. Penny found some stinky dead stuff to roll in [she always does, that's her thing] I took tons of amazing shots of wildflowers. There's always a symbol of past visitors on the backside of a certain hill and today we found a peace sign shaped with rocks. Really nice. I've seen some freaky stuff there post-Halloween, but that's another season. All in all, a great day. The horses were happy, we didn't spy the big pink pig at the farm, but we're hopeful for next time. happy spring. Spring has come in a big way. It's really beautiful sunny and warm here in Sonoma. Great day for a long hike at our nearby regional park in Glen Ellen. The assortment of blooming wildflowers is amazing. There's a great variety of wildlife too. We've seen coyotes, bobcats, otters, deer, snakes and birds like crazy. 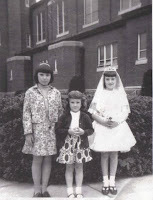 Happy Birthday to my sister Carol [she's the one in the communion dress]. Have a wonderful day. 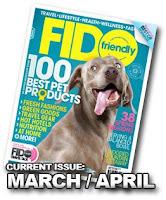 We're in fido friendly's top 100 best products! This is a really entertaining mag with excellent content. Thanks very much Fido Friendly. We found out today that President Obama is putting a stop to the downer cattle/animal abuse. Remember that horrible video last year from a horrible slaughter plant in southern CA? Read more at HSUS. We're so thankful and happy our new administration is doing the right thing. The new policies will restore the dignity to sentient creatures, improve the quality of our food supply chain and expose the cruelty at facilities that are substandard. Go to the White House website to view this week's address. We're loving our new packaging. It's a rice paper pouch [with a sweet little window] and we know our customers will love'em too. 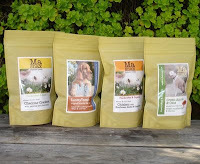 They have a wonderfully elegant and supple handfeel to them and our colorful labels really stand out. We're always searching for new and different eco-friendly packaging options. Some are quite cost-prohibitive not to mention impractical when they're corn-based. So, let's chop down rainforests to grow more corn? No. 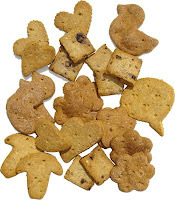 These are of course recyclable, but we wish they were compostable as well. They are however, poly lined for stability and to make them food grade. Here's some pix. Well, we're finally feeling better. It seems like this bad bug took along time to run its course. 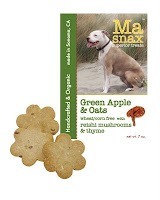 We love our new treat; it's Green Apple & Oats with Reishi Mushrooms and Thyme. 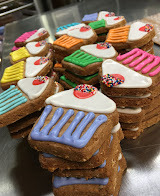 Now that my sense of smell has returned, I'm loving this cookie! [Penny loves it too]. She has mastered her new indoor rainy-day trick of "catch the cookie" in mid air with this treat. 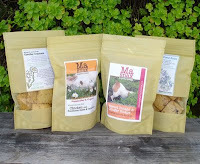 We're using reishi mushroom powder, organic dried thyme and granulated kelp in the recipe. Basically we infused some immune boosting goodness into our already popular green apple & oats recipe. 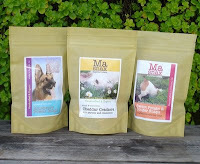 Our furry testers wholeheartedly approved.